Regarding Captain Midnight and the so-called "decoder rings" of the era... up front: there were no "decoder rings" offered in the entire era of Old-Time radio. There were, though, "decoder pins." The basic origin of "decoders" on Old-Time Radio was the Wander Company, makers of Ovaltine. It started with their radio program, Little Orphan Annie, in 1934. The sponsor started a fan club, Radio Orphan Annie's Secret Society. It had a membership pin and a member's handbook. Inside the handbook was a very simple ciphering scheme that any child could learn to decipher and encipher messages: each letter's position in the alphabet was given a number double its numerical position (i.e., A=2, B=4, C=6, ..., Y=50, Z=52, and &=54). 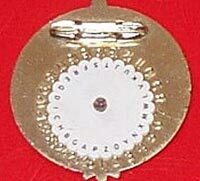 The following year, the 1935 Radio Orphan Annie's Secret Society membership pin was a "decoder" pin. Numbers were always used as substitutes for letters, probably because each number from 1 through 26 has a unique sound, whereas many letters sound similar (C, B, T, G, Z, etc.). Ovaltine continued this with Little Orphan Annie annually, until they dropped sponsorship in the Spring of 1940. They continued the tradition with Captain Midnight, which they picked up sponsorship in the Fall of 1940. Instead of calling them "decoder pins," they were called "Code-O-Graphs." The Code-O-Graph models were 1941, 1942, and 1945 - 1949; the hiatus caused by materials restrictions in the war years. As with the "decoder pins," numbers were used as letter substitutes. The first four Code-O-Graphs were badges; the last three, pocket items. All used the same cipher scheme, called "simple substitution," or technically, "monalphabetic substitution," where each number represented the same letter throughout the message. There were a few other "decoders" offered over the radio, each really a cipher device. Red Ryder had one, as did Space Patrol. Tom Mix Ralston Straight Shooters offered two real decoder premiums, where a symbol meant a word or phrase, but neither of these were rings. Sky King had a cipher element in the Spy-Detecto-Writer premium, but this one was never exploited over the radio and used letters rather than numbers. Carrying the Captain Midnight motif to the much-different television show, there were two TV cryptological premiums, neither called Code-O-Graphs. 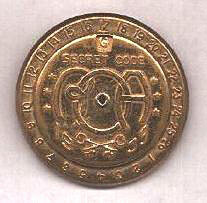 The first was the Plane-Puzzle Decoder Pin, a 1955-56 item. It used numbers to substitute for letters, in the tradition of the radio era. The next year was the Silver Dart Decoder Pin, which used letters to substitute for other letters, and an interesting encryption scheme, but it, too, used monalphabetic substitution. 1955-56 TV premium, Captain Midnight Plane Puzzle decoder ring. But where did "decoder rings" come from? I suspect this is a confusion of two types of radio premium: The Secret Decoder and the Secret Compartment Ring. The latter ring type was fairly common: Captain Midnight offered the Sliding Secret Compartment Ring, and the Aztec Sun God Ring. Sky King had the Radar Signal Ring, the Mystery Picture Ring, and the Magni-Glo Writing Ring. Each could conceal a small piece of folded paper or some frames of microfilm (if children could get any). So, in some minds, "Secret Decoder" could have replaced "Secret Compartment," leading to the current myth. 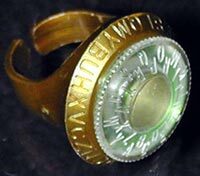 To complete the story, by the early 1960s, "secret decoder rings" had entered the lexicon, so some people developed a few. 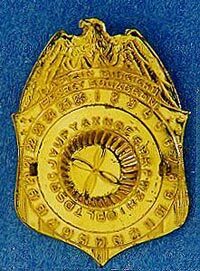 The best of the lot was the PF [Tennis Shoes] Decoder Ring, which was associated with the Jonny Quest television show. It substituted letters for letters, and even had a secret compartment! Later, Kix cereal produced a Kix Secret Agent Decoder Ring, which was a cereal premium. 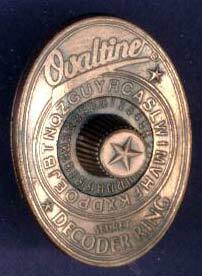 In 2000, Ovaltine offered the Ovaltine Secret Decoder Ring on the labels of its "tins." They advertised, "It's back!" despite that they'd never offered one before. Interestingly, the "decoder" used numbers-for-letters substitution, like the oldest Radio Orphan Annie Decoder Pin.